In 1780 Matlock Boat-House was advertised as being to Let. It was described as being "pleasantly situated on the Road-Side, near the River Derwent, about one Mile from the Bath, with good Stables and Gardens ; fit either for a private Family or an Inn", with particulars available from Mr. Leacroft. In 1813 the lease on the property had thirteen more years to run. The 1813 advertisement is the first time we see limestone burning or quarrying mentioned in relation to the Boat House. "The land abounds with limestone and the purchaser will have the use of getting and selling the stone, or of burning the same into Lime, without paying any extra rent for the premises for the reminder of the lease". The Boat House Inn, together with a cottage and Lime Works, was on the market again in 1829 when it was to be auctioned by George Smith. The tenant at the time, William Rawson, was to show the premises to prospective buyers. When Mr. Adin sold his property in 1837 the stone built Boat House Inn had a parlour, several good lodging rooms, cellars, brewhouse, kitchen, stable and coach house with chamber over, small dwelling house and a good garden. The lime kiln had been "lately lined through with brick at considerable expence". It also had a carpenter's shop, a boat on the river and additional land on which "several houses might be built". Its frontage on the Matlock and Bakewell turnpike road was over a hundred and six yards in length. The rest of his estate - household furniture as well as a bag of hops and a strong built double bodied phaeton - were sold a short time later. We learn from White's Directory of 1862 that the Hotel was "within ten minutes' walk of Matlock Bridge station, and is fitted up with every convenience conducive to the comfort of visitors, who can, at a minute's notice, be supplied with boats for a row on the river". The bridge in the picture, with two large rounded arches and one square one plus a small arch for pedestrians on the far bank, is the railway bridge built when the railway came to Matlock in the late 1840s. Some children are standing on the pavement opposite the Hotel, close to a gap in the wall and an open wooden gate that leads to a small area of the riverbank. Presumably, it was from here that boats mentioned in White's Directory could be hired and was where the private waters for fishermen also were. The hotel itself looks a bit battered in the top image. A letter was read at a Council meeting in 1900, drawing attention hotel's sign being dangerous; the owner was to remove it. Whether this is the replacement is not known, but there was still a sign on the next image, when the hotel looked a little more cared for. The following year the The Town Clerk was to write to the County Council about legal proceedings against a visitor who had, allegedly, damaged a wall near the Boat House Hotel. These walls look strong, but Derbyshire County Council would have had to repair the damage and, presumably, prosecute the vandal. Below is an old undated photograph that was taken from the iron river bridge looking towards the Boat House. It provides a good view of the separate stable/carriage building. The inn's door and windows are open on a warm summer's day; the front door was the original, also seen on Dale Road, Boat House Hotel & River, early 1900s. However, this photo pre-dates that image as the Hardy's Ale sign on the side of the Boat House is not shown here. A boat is moored at the water's edge and is, presumably, one of the boats that the Boat House used to hire out. 1. 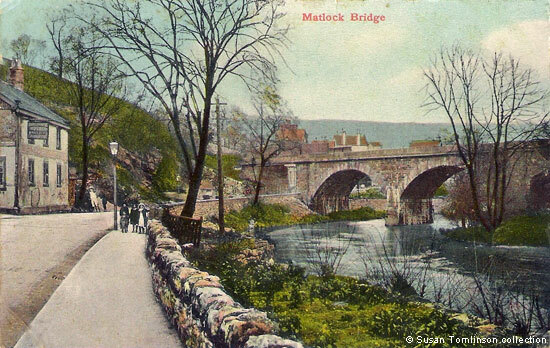 "Matlock Bridge". Derbyshire "Artistic" Series, published by G. Marsden & Son, Wirksworth and London, No.2606. Posted at Matlock 4 Aug 1909. Postcard in the collection of and provided by and © Susan Tomlinson. 2. Old photograph of the Boat House, no date, in the collection of and provided by and © Glynn Waite. "Derby Mercury", 16 June 1780, Advertisement. Mr. Leacroft was a local attorney: see Leacroft Pedigree. "Derby Mercury", 14 January 1813, Advertisement. "Derby Mercury", 1 July 1829, Advertisement. "Derbyshire Courier", 18 March 1837. William Adin passed away two days later. See: Will, Surnames A - 1837 (it does not mention property's name). He had married Ruth Allsworth (or Halsworth) at Bulwell on 18 Jun 1832 by licence; he then lived at St Peter, Nottingham. His widow, Ruth, went on the marry William Hill on 30 Oct 1837 at Kennington. "Derbyshire Courier", 17 June 1837. 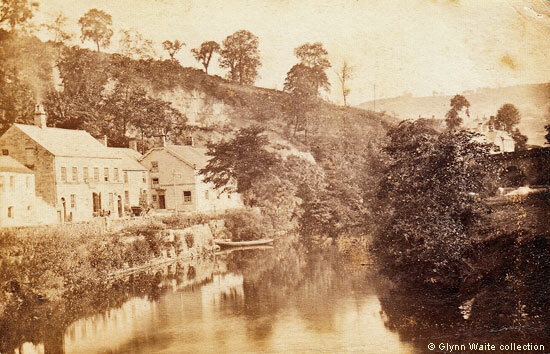 See Matlock: River Derwent near the Boat House Hotel, about 1904-5. "Derbyshire Times", 7 March 1900. Meeting of Matlock Council. The sign reads "Boat House Hotel --- ---"
 "Derbyshire Times", 17 April 1901. The visitor's actions were described as the "wilful throwing down of a wall", so he or she must have pushed it over.